April is Native Plant Month, and we are in for a special treat. Stacy Anderson, Joe Davitt, and Tobin Weatherson from the San Diego Zoo’s Institute for Conservation Research will describe their work establishing the Native Plant Seed Bank. In collaboration with the Royal Botanic Gardens at Kew, the Institute has been working to conserve and rescue many of our county’s indigenous plant species using a variety of methods for drying, freezing, and storing seeds. The Native Seed Bank also undertakes special conservation practices so that the seeds they save will be viable and can be grown and propagated as needed. 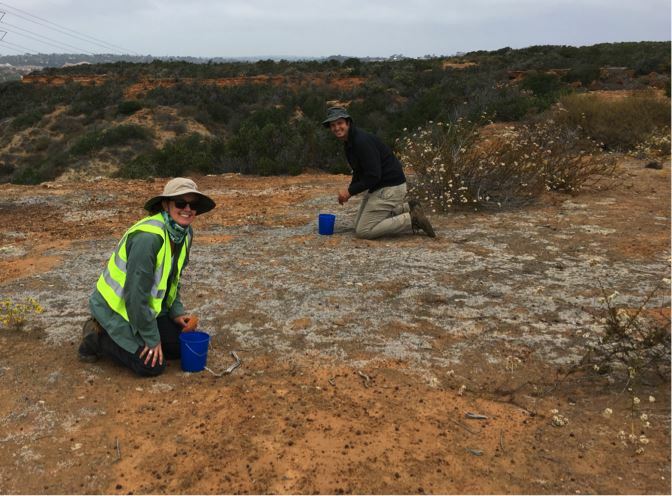 Since 2004, the Institute has been working jointly with state and local government agencies such as the Bureau of Land Management and SANDAG, the San Diego Association of Governments, as well as Kew Gardens and local plant rescue groups to preserve our local native flora. While many of us are familiar with the San Diego Zoo’s efforts to breed and conserve endangered animal species, our April 9th meeting will showcase a mission of the Zoo that is seldom seen. This mission is particularly important to SDHS, as it conserves plants from our own backyard that are threatened by urban development and a changing climate. Come listen to what is sure to be an inspiring and encouraging presentation.